The clamp opens 2″ wide and the numbers on the display are 1/4″ tall. It ships with test leads, instructions, a 9V battery, and a nylon carry case. 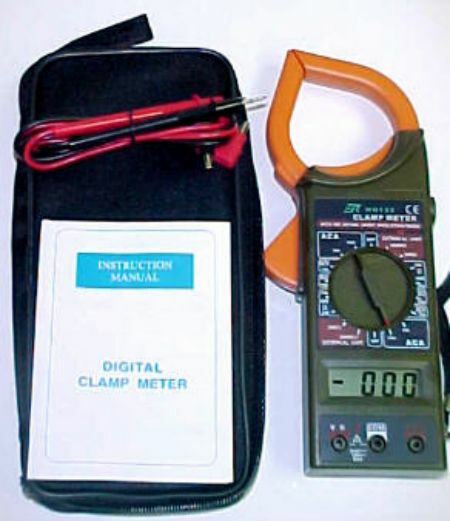 After playing with an AC clamp meter for a week, you’ll want one that does DC too, for car work. Unfortunately, measuring DC amperage with a clamp is considerably more complex than AC amperage, and the meters that do it are fairly expensive, usually in the $200 range, though I’ve seen them as low as $60 at Sears. I’m skeptical of this thing, not just because of the low price, but the 1000A capacity. That’s fine if you’re working regularly with giant loads, but most of the time you’ll be so near the bottom of its range, it won’t be very accurate. One way to work around the low-range problem is by multiplying the input signal. Wrap the wire you’re measuring around the jaw a few times, then divide the reading by that number. For about $10, you can get an “AC line splitter” which plugs inline between an appliance and an outlet. Not only does it save you from having to slice open an extension cord, it also has 1x and 10x holes to clamp through, for exactly this reason.